Rev. 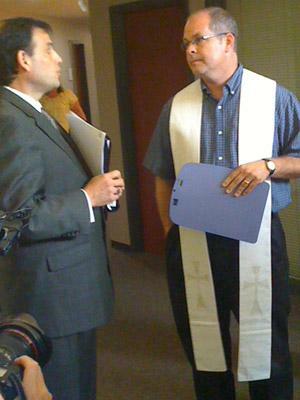 Kevin Cameron, senior pastor at Parkway United Church of Christ, delivers a letter to Steve Taylor, press secretary for Congressman Todd Akin. Several pastors and ministers are dismissing an apology from Missouri Congressman Todd Akin for his statement last week in an interview that "at the heart of liberalism really is a hatred for God." The clergy from the Republican Congressman's district delivered a letter to his office this morning Wednesday asking him to reconsider his words. Akin made the comments while discussing a TV clip of the Pledge of Allegiance that omitted the phrase "under God" during NBC's broadcast of the U.S. Open golf tournament. Reverend Krista Taves is a minister at Emerson Unitarian Universalist Chapel in Ellisville, Mo. and said the group is also asking Akin to reconsider his moral priorities as a political leader. "And I think it's really dangerous when you turn something like the Pledge of Allegiance into a litmus test for moral faith," Taves said. "When you look at the budget that he just passed, it harms the most vulnerable in our society. And that is clearly contrary to the words of Jesus, who he follows, which is 'as you serve the least of these, so you serve me'." Akin was not available to meet with the clergy when they delivered the letter.